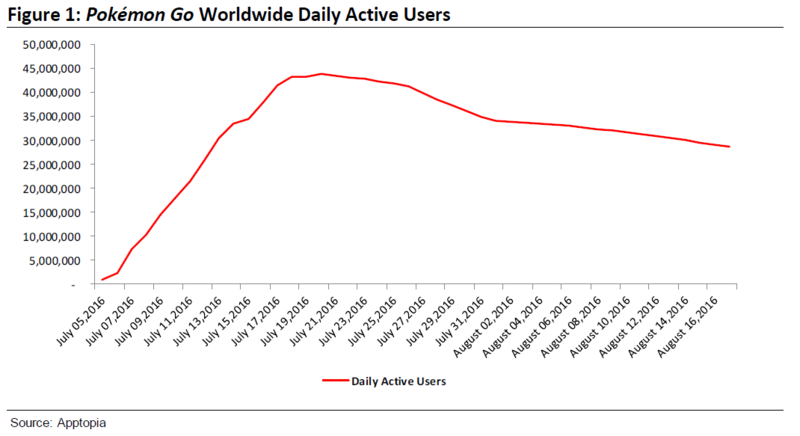 The Pokemon Company and Niantic's Pokemon Go is beginning to cool down a bit, dropping from a peak of around 44 million daily active users down to around 30 million. That peak was around July 21, 2016. According to raw data from Sensor Tower, SurveyMonkey, and Apptopia reported on by Bloomberg, engagement has also dropped to under 60 percent. "Given the rapid rise in usage of the Pokémon Go app since the launch in July, investors have been concerned that this new user experience has been detracting from time spent on other mobile focused apps," writes Axiom Capital Management senior analyst Victor Anthony. "The declining trends should assuage investor concerns about the impact of Pokémon Go on time spent on the above named companies." Disgruntled fans will probably point to the ongoing issues surrounding the game. The game's updated tracking feature is still in testing, leaving many players without an adequate way to hunt Pokemon. There's also the continuing issue with players in more rural areas who lack Pokemon spawns, Pokestops, and Gyms, which prevent them from enjoying the game as much as their urban-dwelling counterparts. That said, this feels more like Pokemon Go coming down from a boosted high. This in a normalization of the consistent playerbase for the game. At the height of its popularity, there were probably a number of casual and mainstream consumers who tried out the game to see what all the fuss was about. The game is likely shedding many of those users, in addition to those who stopped playing due to the above issues. Pokemon Go is experiencing a similar sentiment to Blizzard's World of Warcraft: a decline used to paint in a much bleaker picture than reality. Like WoW, Pokemon Go has lost a number of users, but its numbers still put it well ahead of its competition. According Apptopia's Top Charts, Pokemon Go is the number 4 title on the Google Play Store and number 16 on the Apple App Store. At the same time, it's the highest grossing title on both store, meaning Niantic and the Pokemon Company are still raking in a good amount of money. Chart via Apptopia and Bloomberg. Which is to say it's a bit early for the doom and gloom. If you're enjoying Pokemon Go, Niantic will be supporting it for a good long while. If you're not, there's plenty of other games out there to enjoy.